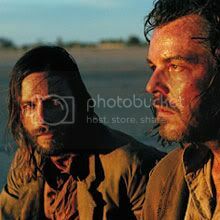 Tonight I watched The Proposition. It is an excellent film, I found it really disturbing. The location was so eery, the whole idea of the Australian outback just scares me anyway. Add some creepy Nick Cave music and brilliant sound editing, and you've got a great film. Excellent performances too.